It was easy to predict the arrive of the Asian hornet in Italy. This invasive alien species native to South-East Asia, was recorded in Europe for the first time in France in 2004, where it was probably introduced accidentally through the horticultural trade. It spread very rapidly across south-western France (at around 100 km per year), and soon reached Spain, Portugal and Belgium. At the time the EEA report on invasive alien species impact was published (December 2012) it was considered likely to arrive soon also in Italy and Great Britain. 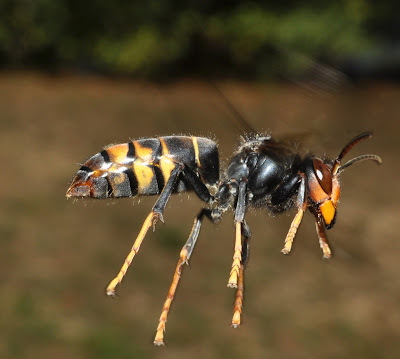 In fact the news of the arrive of this hornet in Italy was circulated in May 2013, although the new record of the species originates from monitoring activities carried out already in November 2012 (see press release of the University of Turin). This shows that an effective early warning and rapid response system for alien species in Europe is urgently needed, so as to prevent further impacts related to biological invasions. Invasion risk modelling already suggested that the Asian hornet - Vespa velutina or yellow-legged hornet to be more precise - could spread over a large part of Europe (see article published on Aliens no.31). And there are good reasons to be concerned about the spread of this “giant wasp”. With a body length of 2-3 cm Vespa velutina is in fact a social wasp slightly smaller than the native European hornet Vespa crabro. The head is black with an orange-yellow face. The body is dark brown or black velvety, bordered with a fine yellow band and a single abdominal segment almost entirely yellowy-orange, which makes it difficult to confuse with any other species. The Asian hornet is mainly a predator of social wasps and bees, and like the European hornet, it also consumes a wide variety of other insect preys. Honeybees are among the hornet’s main preys, so the Asian hornet is expected to have an economic impact on beekeeping activities. In fact, as a highly effective predator, the new hornet may represent an additional component to the decline of honey bee populations in Europe and its big colonies and diet spectrum suggest that it could have a noticeable impact on biodiversity, including many wild pollinators and other beneficial insects. Otherwise, this species is no more dangerous for humans than the European hornet as in general it is not aggressive. However, its large size, painful sting and noisy flight make it a very frightening insect (and stings may potentially cause life threatening allergic reactions). In general, they will not attack as long as the colonies remain undisturbed, so it is necessary to avoid getting close to their very large nests, which are from 50 to 80 cm in diameter, and might be found in tall trees in urban and rural areas, including garages, sheds, and sometime in holes in walls or in the ground. The life-cycle of this social insect is very efficient: each colony, initiated by a single individual, can produce several thousands of workers, plus hundreds of males and new founders able to mate and subsequently produce new colonies. Nevertheless research to develop an effective control method for Asian hornets is still in progress. You can find additional information about the species and the relevant management options, as well as the contact details for expert assistance on this link.